A new technology of producing an unsinkable aluminum alloy was developed at Peter the Great St. Petersburg Polytechnic University (SPbPU). 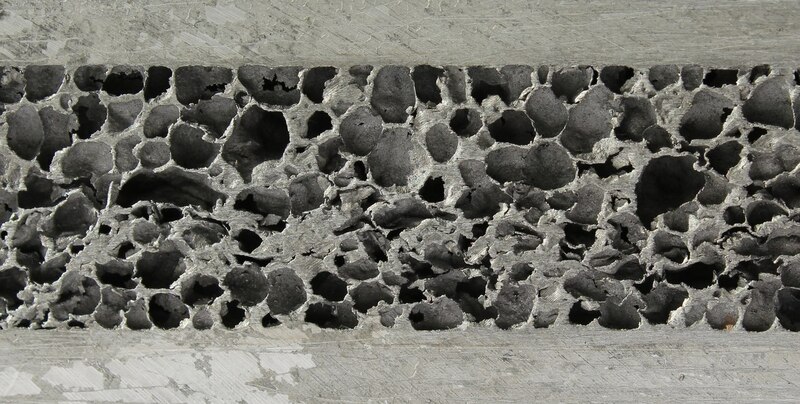 Porosity is produced by the addition of foaming gas into liquid aluminum during re-melting. The porous materials can increase stiffness and sound and heat insulating proprieties, according to the SPbPU's Media-center. "A high porosity level can be used to decrease the density of structural elements, e.g. sheets. The density can be decreased even lower than the density of water. Resulting structural elements would be unsinkable. And its usage in shipbuilding will ensure unsinkability even with a leak in the hull," says Oleg Panchenko, deputy head of the Laboratory of Light Materials and Structures SPbPU, one of the inventors. In many cases, the carrying capacity of thin materials (1 mm or less) is sufficient for a lot of structures. But material with such thickness sometimes has geometric limitations (the thickness is too small for manipulation) or it can't be joined without deformation. Due to the material's porosity, it is possible to increase the thickness, maintaining the weight while stiffening the structure. A similar technology has been patented in Japan, but it produces only entirely porous material. Researchers of SPbPU found a way to produce homogeneous and heterogeneous distribution of pores in the material. Because it is made of solid material, it can be either porous if necessary or with nonporous thickening or solid structure. Using this technology, double-layer sandwiches may be produced in which only one side is porous, increased density can be conferred to selected areas for mechanical or welded joints.